If my email box is any indictor, some of you have been wondering if psyllium husk REALLY is the next best thing since sliced gluten-free bread. This bulk laxative, fiber supplement, and colon cleanser is produced from the seed of the Plantago plant (a plant that has a long history of medicinal use here on earth). But just recently, a new gluten-free cookbook from America’s Test Kitchen claiming “revolutionary techniques” and “groundbreaking recipes” said psyllium husks powder was far better than xanthan gum in gluten-free bread. In fact, the cookbook said it “resulted in a more delicate crumb” and “provided a stronger protein network that trapped gas and steam” in their bread recipes. Sounded like I needed to do a little more testing! Trouble was, I didn’t want to make their bread. It had mostly white rice and starch in it (34 ounces out of a total 42.25 ounces, or 80%), with only a little brown rice flour thrown in almost as an after thought (to reduce the “starchiness” of all the starch they added, and to “add flavor notes” to all the flavorless starches they used). I stopped using rice flour in bread back in 2003 and even though I test flour mixes that contain it every now and then, I’ve never returned to it. I not only like the taste and texture of bread made with my millet and sorghum bread flour mix, but I think we need gluten-free flour diversity in our diet. Even though I don’t eat a lot of baked goods, I don’t think it’s a good idea to use rice flour in every baked good we do make (wasn’t that part of the problem with wheat- that it was everywhere?). First consideration: I needed to create a test that made sense for my recipes and my bread flour mix which contains millet, sorghum, potato starch, tapioca starch and corn starch. Would psyllium husks powder work with flour blends and recipes that weren’t in the new “groundbreaking” cookbook? Yes, according to the blogosphere where there are hundreds (if not thousands) of permutations of various gluten-free recipes using psyllium husk in place of xanthan gum. Second consideration: I needed a bread recipe so simple and basic that the nuances of the effect of the psyllium husks powder would be obvious to me. The bread recipe would have to have very few ingredients, so I could see what happened when I took out the xanthan gum and replaced it psyllium husk. Otherwise, why bother adding another new expensive ingredient I didn’t need? I already had a recipe that worked well. And to those of you who really hate the idea of xanthan gum because it comes the secretions of the Xanthomonas campestris bacteria after a glucose induced fermentation frenzy, well I can’t talk you out of it. But I’m personally ok with helpful bacteria and the science behind how xanthan gum is produced from corn or wheat or cabbage glucose (glucose is sugar- not protein). Anyway, according to microbiologists the world over, especially those who are working at the American Gut project, we are all filled with lots of helpful bacteria – and their excrement. I’m thinking a little more bacterial excrement now and then isn’t going tip the balance in my body. And to those of you think psyllium husk is healthier than xanthan gum because it gives you added fiber, my thought is this: ideally, we should be getting our soluble and insoluble fiber from natural, whole plant sources because in addition to feeding the healthy flora in our guts, real whole foods offer nutrition to our bodies (plant sources including cruciferous vegetables, leafy green vegetables, squash, sweet potatoes, nuts, seeds, and fruit, especially pears, apples, and berries). 100% pure Psyllium husk is simply empty calories. And to those of you who are really just looking to be more “regular”, I’ve heard rumors that butternut squash is the “white knight of poop”. Just saying. I choose my very basic and easy to make Submarine Sandwich bread from Gluten-Free Baking Classics. It’s so easy that I use it in “introduction” classes to gluten-free baking. The bread contains only 1 1/2 cups of my bread flour mix, 1 teaspoon of xanthan gum, active dry yeast, water, and a tiny bit of salt, sugar, and olive oil. No eggs. No milk. No other funky gluten-free add-ins – other than the xanthan gum. The recipe reads like a wheat submarine sandwich bread recipe, except for the flour and the xanthan gum, and it makes a good tasting, golden brown loaf with a nice soft, airy crumb structure. I also choose this particular recipe because it has a nice slow rise; i.e. it isn’t fast rising like a pizza crust or bread sticks. I wanted to take psyllium husk out for a proper test run. I did a lot looking into just how much psylliun husk to use and I can only say that there doesn’t seem to be any set rule for home bakers. Every cookbook writer or blogger seems to have their own notion about just how much to use. And that notion seems to depend on the flour mix, or lack there of, and the baked good they’re trying to make. The first non-industrial baking recipes to use psyllium husk for came out in cookbooks and on websites for individuals with diabetes and people who were trying to keep their glycemic levels low by adding fiber to their diet. Since then, writers recommend using anywhere from a tiny bit to 5 or 6 tablespoons per loaf. Of course, he also said it gave his mostly cornstarch bread (“cornflour” in England) a crumb and crust “more like wheat bread”. But he used it with xanthan gum in that first published bread recipe (link above). And he uses a little more than 2 tablespoons of it (25 grams). That’s a lot of colon cleanser. In a later recipe without xanthan gum, Lepard used 50 grams (there are about 10 grams per tablespoon) and dairy, and another 25 to 50 grams of flax seed in his all cornstarch bread. Then, some time after Dan Lepard’s column ran in The Guardian, psyllium husk went from being used as a fiber add-in to a texture enhancer to a stand-alone replacement for xanthan gum for home bakers. In reality, psyllium husk was being studied as a possible substitute for gluten in industrially produced gluten-free breads as far back as the early 1990s (when Bette Hagman introduced the first gluten-free” flour mix”, xanthan gum, and the use of extra eggs, egg whites, and powdered milk to gluten-free home bakers). But again, depending on the proportions, the flours and the other ingredients used (which often included dairy, eggs, bread enzymes, or other highly processed ingredients) the industrial testing results varied widely. I decided to test three combinations: 1 level tablespoon psyllium husks powder, 2 level tablespoons psyllium husks powder and 1 level teaspoon psyllium husks powder against 1 level teaspoon xanthan gum in my submarine sandwich bread from Gluten-Free Baking Classics. I shaped the bread a little longer and thinner than a regular submarine sandwich bread and baked it in a 2 1/2-inch wide French bread pan. I used Yerba Primi Psyllium Husks Powder that I purchased at a Whole Foods for $9.49 for a 12 ounce jar (a jar that wouldn’t last too long if I were using the same amounts that Dan Lepard and many others use in their breads). How did the bread made with 2 tablespoons of psyllium husk powder turn out? When it came out of the oven it was really tight and small. Interestingly, so was the bread made with only 1 teaspoon. So how do I explain it all? The final loaf volume of gluten-free loaves depends on the stability of the gel formed by the hydrocolloids added to the dough. Xanthan gum is a thickener, stabilizer, emulsifier and foaming agent. It provides structure and is stable over a broad range of temperatures. Pyllium husk, however, forms a gel that is stable only up to temperatures of about 176ºF (80ºC) (1), depending on the amount used in the recipe. So while psyllium husk is very useful for holding in the carbon dioxide based gas bubbles during proofing, once you put the bread into a hot oven and it starts to bake and the internal temperature rises, the loaf will ultimately collapse – IF you are depending only on psyllium husk to give structure to the bread. Many of the cookbook writers or bloggers who feel they are successfully creating baked goods using psyllium husk to replace xanthan gum create recipes that contain eggs. For example, all the recipes in the ATK’s new “groundbreaking” cookbook use 2 large eggs and 3 tablespoons of psyllium husk powder to make a bread that is 80% starch and contains a little more than 3 cups of flour. What is happening in their recipes is this: at the point where the psyllium husk starts to fail as a gel, if the bread contains tapioca starch or even potato starch (which many do), the tapioca starch can act like a bridge until the egg proteins take over to help hold the bread up. The tapioca is able to act like a bridge because it gelatinizes at a higher temperature than psylium husk (or potato starch, for that matter). Then, the proteins in the egg provide some of the structure necessary to hold the bread up. But if you’ve ever made a bread that uses just eggs, and no xantham gum, for extra added support, you already know that the xantham gum does a better job. Writers whose recipes don’t contain eggs, often contain other seeds, sometimes in large quantities. And some cookbook writers and bloggers create recipes that really just rely on a combination of heavier whole grain or non-grain flours that would produce a pretty solid bread (read: dense) with or without psyllium husk. The recipes that depend on other seed gels (like flax seed gel) instead of eggs to help the psyllium husks powder provide structure have a similar problem. Although I sometimes use flax seed gel as an egg replacer when I bake for people who have egg allergies, it really is better suited to helping hold things together (as an emulsifier). Flax gels are weak structure builders because they don’t have the relatively strong protein network of eggs to reinforce dough and batters. As a result, fully baked cakes, muffins and breads won’t be as light and airy when using flax seed gels to replace eggs. (Flax seed gel also won’t act as a foaming agent, which you would need to make an angle food cake). 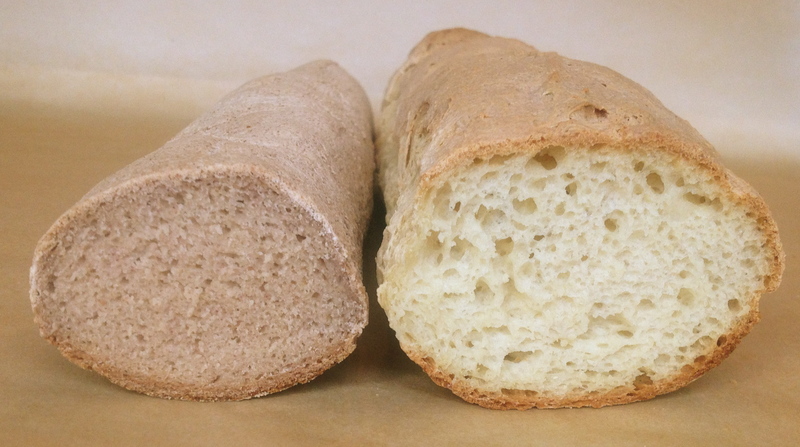 Xanthan gum makes a prettier, better textured, better tasting, lighter and more airy bread than psyllium husk in my simple submarine bread recipe. Perhaps if I had to add eggs or egg whites to it in order to create a decent loaf, the test outcome would be different. But I don’t. The recipe doesn’t contain seed gels, or any other out-of- the-ordinary gluten-free add-ins. In fact, none of my artisan breads contain do: not my Focaccia, French-Italian bread, pizza crust, multigrain artisan bread, or any of the rest. My thinking when I developed these recipes was this: wheat pizza crusts and wheat baguettes don’t contain eggs or gels; I wanted to maintain the integrity of original recipes to the best of my abilities. I won’t be adding eggs or seed gels to any of my artisan breads, so it looks like I’ll be sticking with xanthan gum- at least for now. The bottom line is this: it is possible to use psyllium husk to replace xanthan gum in gluten-free breads. You just have understand that your end product will look and taste even more like a gluten-free bread. (1) Haque, A., Richardson, R. K., Morris, E. R., & Dea, I. C. M. (1993). Xanthan-like weak gel rheology from dispersions of ispaghula seed husk. Carbohydrate Polymers, 22(4), 223-232. This was a very interesting test. Thank you for the detailed explanation. I am gluten and corn allergic so I am always looking for an alternative to xanthum gum. I have had excellent results with your recipes substituting guar gum for xanthum gum. I also substitute potato starch for cornstarch. When will you publish another cookbook? I love your recipes! So glad you liked the test! To my way of thinking, you’re still better off with guar gum than psyllium husk.And I think potato starch is a good substitute for the corn starch, too. I’m hoping my next cookbook will be out in the late fall. The focus will be baking! Wow! This is a very timely commentary. I just received a copy of the America’s Test Kitchen book, and I didn’t know what to think about all the hype regarding psyllium husk. I know some bloggers were touting it a couple of years ago, and I couldn’t understand then—nor do I now—what is all the objection to xanthan gum (or to canola oil, for that matter). I have found ATK recipes to be pretty good in the past, and I was beginning to wonder whether they might actually be onto something for the gluten-free world. Your test and the photos have convinced me not to bother with this tangent. Once again, You have come through with information that keeps me from wasting time and money on brave new ideas that will produce results inferior to the ones we rely on from your books. Many thanks, Annalise. You are very welcome! Glad to be of service. Even though I usually like their work, I think ATK over-complicated many of the gluten-free recipes in their book (for example, it takes a little more than one hour to bake their pizza crust from start to finish). And they aren’t really using any ingredients that haven’t been used by many other gluten-free cookbook writers like Bette Hagman, Rebecca Reilly and Beth Hillson. I was hoping there might be something really new and different there, but alas, no new reinvented wheel for us gluten-free bakers. Thank you for all that great di-mystification of the ATK bread recipes. I like your scientific approach to the topic. And I love your Baking Classics cookbook. Your brownies are the best ever, wheat or no wheat! And I love the carrot muffins. Can’t wait to read and cook with your next book. So happy to hear you are enjoying my recipes. The next book has a lot of really delicious recipes and I hope you’re able to find a couple more favorites! Thanks for the update! I was going to contact you today anyway & ask if you have the weights for your Bread Flour Mixes? I find it so much easier (and less messy!) to just weigh out each flour ingredient rather then measuring. I just purchased the Bread Machine book but have used bread recepies in the other one for years. Quite a few years ago I attended a class that used the psyllium husk powder in Kinnikinnick’s Bread & bun Mix to make a yeast bread. This worked very well & made a dough to knead & shape like wheat bread. There was also a version that made croissants – plain or with a cheese or ham filling. My mother often shaped her buns into croissants! Just flatten, cut, roll up. And looks special! I think they changed the Mix some later because then I had to add Xanthum to be successful. I haven’t tried it lately as the Mix is quite high priced! Thanks for all the effort! The post I did about the weighing flour to make my mixes is right here on this blog. Go to the side bar and click on the link for Flour Mixes. Then look for the post and click on it. And yes, the psyllium husk can work for certain kinds of recipes, but it’s use is somewhat limited and depends on your expectations. If I tried to give my then young son a meatball hero on a sub bread that looked like the one made with psyllium husks powder in the picture of above, I’d have ended up with one unhappy kid! Fun idea about the croissant! First, thanks very much for your fab GF Baking Classics book. I wore it out in the first years after my GF diagnosis (especially loved the mandel bread). Then I realized that xanthan gum caused me symptoms similar to gluten, and baking has become very limited since. I don’t think my body likes guar gum, either. I purchased husks after seeing several recipes that use them but haven’t tried them yet. So I appreciate your experiment with its detailed explanation, and now don’t know if I’ll even bother to try it on my own. But please understand that xanthan gum bothers lots of people. Finding an alternative isn’t a fad, as far as I’m concerned. I certainly understand that some people are sensitive to guar and xanthan gum, just like there are many who can’t tolerate psyllium. That’s why it’s so nice that there are several options for people to choose. The important thing when choosing, I think, is knowing the constraints and limitations of the option you use. Because I’ve received questions using psyllium husks powder in my recipes, and because it seems to be touted as good for gluten-free bread, I thought people might be interested in my test. This way, while someone might not use it make a traditional submarine sandwich for a young child, they might be happy with the result for themselves. At least they’ll know what they’re getting in to! It’s good to hear you like that Mandelbrot recipe as much as I do!! this is one of the best tests and explanations I have seen on this subject. Have you done anything similar with Chia flour? One reason is that I really like it’s protein content; and also, I have tried some bread recipes online and something is upsetting my intestines. (I have had to have my gall bladder removed.) So I am back to a simple basic blend of: almond flour and fine ground brown rice with tapioca and potato flours and a bit of chia flour. It works great for pancakes and muffins and cookies- but I need to get brave and succeed in bread for my kids health. And no, I haven’t tested chia flour. Although I sprinkle chia seeds over my fruit and yogurt, and I’ve tried using chia eggs in baked goods, I think they are still so relatively expensive (and the flour is often $11 or more a pound in the New York metro area), that I don’t feel comfortable advocating it for baking. I also think it has a kind of strong non-traditional taste and so, for me, there are better options when trying to reproduce classic baked goods with gluten- free flours. But if you’ve been successful with it, you might give it a run in one of my bread recipes. I’d love to know how you make out. It’s interesting that you say chia has a strong taste. I’ve been hearing all over the internet that chia is the only thing that is tasteless and can be added to any recipe without changing the taste of the recipe. So now I’m wondering what these people are talking about !! Well, I do believe that people taste things differently. But it is certainly not tasteless. I know that I have a very sensitive palette and can detect the nuances of different flavors in food and baked goods. So to me, when I tried chia seed gel to replace xanthan gum in my vanilla cupcake recipe (see the Cup 4 Cup post here on this blog for more information about why I always choose this recipe for my comparison tests), I could tell it was there, not just because the texture and appearance was different (ie. not like a classic vanilla wheat cupcake), but because it had another layer of flavor that hadn’t been there before. That extra flavor took away from the focus of the cupcake- the vanilla. However, perhaps I described it badly and I apologize for that: it wasn’t “strong” in the normal sense, like it would have been if I had added pepper. But I could tell that the extra (non-classic cupcake) flavor was there in the cupcake and I didn’t think it added anything; it was more a distraction. That said, many people really like to use chia and/flax seed gels in their baked goods and perhaps either they don’t notice it or they don’t mind it. The other critical thing, is that they may not be using it in such a simple, basic recipe: I might be less likely to be able to detect the chia flavor in a chocolate cupcake (but I’d be sure to notice the change in texture and appearance). I hope this helps to explain why my prospective is a little different than others. I find chia seeds taste a little like a cross between tapioca pearls and mild sprouts… it should be masked pretty easily by the right thing, but I also found the texture when I used to soak whole ones and add it to shakes as a little off putting like a cross between seeds and tapioca pearls, though I didn’t notice the texture at all or the taste much when mixed with raspberries or blackberries and sweetener. As such, I’d question using it for baking something plain like angel food cake, but would consider trying for chocolate cake. It has a powerful gelling effect so I imagine it might be cost effective if the recipe doesn’t call for much, though psyllium and flax are cheaper. You gave an excellent description of the taste and texture. And I think it would be harder for me, as well, to detect the taste of the chia in a chocolate cupcake versus a more delicate flavored cake (but I’d be sure to notice the change in texture and appearance). As I wrote above, I believe people taste things differently. So when I tried chia seed gel to replace xanthan gum in my vanilla cupcake recipe (see the Cup 4 Cup post here on this blog for more information about why I always choose this recipe for my comparison tests), I could tell it was there, not just because the texture and appearance was different (ie. not like a classic vanilla wheat cupcake), but because it had another layer of flavor that hadn’t been there before. That extra flavor took away from the focus of the cupcake- the vanilla. The other important thing is that xanthan gum is stabile over a wider range of temperatures then chia and other seed gels. So like ATK and other GF bakers, you might end up needing to reinforce your dough with eggs to hold it up after if finishes baking. If I had to guess about the outcome of your experiment, depending on the other ingredients in the recipe, I’d guess you’ll only get a better baking rise if you added that extra baking soda, and that the overall finished rise won’t be as high if there is psyllium in the recipe. The pre-rise dough will certainly be more malleable and “formable” with the psyllium husk, but again, I think that the psyllium husk will hamper the rise (I could be wrong. Please let me know if you do it!). The weird thing about the ATK pizza is that in their test notes, they said they tried to make the crust crisper by adding increasing amounts oil. They also ended up adding fat-laden almond flour. This doesn’t make any sense at all to me. Adding fat in any form adds tenderness to baked goods — and ATK has a huge amount of fat in their crust, especially for a gluten-free baked good that is mostly starch (1/4 cup oil for about 3 3/4 cup of flour). My pizza crust from Gluten-Free Baking Classics takes a lot less time and bakes up crispy- chewy. I hope you have a chance to give it a try. You can see the recipe at Gourmet.com (it was in the November 2005 print edition). I hope you try your experiment! Great post and thank you for all of the work you do to “get it right” with gluten free recipes so we don’t have to. I have your baking book on kindle and love it. Can’t wait to try the sub rolls! I use the french bread recipe frequently and even use that bread for toast in the morning, yum. The brownie recipe is fantastic too! My coworkers loved the pumpkin muffins I brought to work one day and my son appreciates that we can eat popovers again. Once I ate no bread or baked goods at all and now I eat way too much! Thank you for writing to tell me how much you are enjoying my recipes. If you like the French bread, I think you’ll really the sub rolls. It’s a little bit wetter dough, and so it makes a slightly softer bread with slightly bigger holes- perfect for meatball subs or what ever you want to pile on it. Let me know if you have any questions with the recipe! I bought the new ATK GF cookbook and thus far have made 3 loaves of their Classic Sandwich Bread, which all turned out very good. I had all the ingredients on hand already and experimented a bit with using psyllium husk powder in lieu of xanthan gum a couple of years ago. I do find that baking the ATK bread in a 9x4x4″ USA pan works much better than using a smaller pan with the aluminum foil collar. I’m not surprised that your sub bread turned out to be too dense as the ATK recipes calls for a mind-blowing amount of water (2 cups for a loaf). I also think there is too much dough for an 8-1/2 x 4-1/2″ loaf pan. Maybe next time I’ll use two of the 8-1/2 x 4-1/2″ USA pans and see what happens. Although the slices will be smaller, I doubt they’d be smaller than UDI’s which I pick up occasionally when I’m desperate. I’m absolutely in love with USA pans as I don’t even have to grease or oil the pans before baking. I bought a Brod & Taylor proofer two years ago and find it to be a god-send as I don’t even have to cover the loaf when it’s rising. I know it’s expensive at $148 directly from them but it’s been worth every penny for me. That said, I absolutely love GF Baking Classics and have a loaf of your Basic Sandwich Bread rising now in my proofer set at 80°. I made a number of recipes from that book and my gluten-eating family and friends love the desserts I’ve made (faves include the vanilla cupcakes, lemon squares, lemon-blueberry pound cake, chocolate chip cookies and apple crisp). If you ever feel like experimenting more, I’d love to see what you come up with using whey protein isolate and expandex or Ultratex 3. So far from that Bakes Bread book, I’ve baked two loaves of bread that were bricks that were totally inedible. Now that bread flour mix is so expensive that it blew my mind and not much blows my mind after have been diagnosed with celiac four years ago. I’ve done a lot of experimenting with a number of cookbooks. Yours is definitely a winner and I will be buying the next one you come out with. I’m also glad you’ll include measuring by weight. I picked up an Escali scale for $25 on Amazon and never realized how easy it is to weigh rather than using volume measurements. It’s so nice to hear you are enjoying my recipes! You posted a picture of the lemon blueberry pound cake on Facebook no? As for the ATK recipe, it actually has a similar ratio of water to flour to the sub bread I used in the test. My recipe has 1 1/2 cups of flour to 3/4 cup plus 1 tablespoon water (and only 1 teaspoon xanthan gum, a little sugar, salt, and a teaspoon olive oil). Their recipe has 2 cups water and a little more than 3 1/2 cups flour (plus 3 whole TABLESPOONS psyllium husks powder, butter, 2 eggs, yeast and salt and sugar). And they still had to add 2 whole teaspoons baking powder to get their sandwich bread to rise. As for the USA pans, I think they’re really good! And although I think a proofer is a lovely luxury, I don’t have one. I try to develop recipes that most people can make without having to buy a lot of stuff they don’t already have other than the flours and xanthan gum. I tried Expandex many years ago, but will not do further testing or develop recipes with it. It is a modified starch created through a series of industrial processing techniques that involve chemical, physical, and enzymatic modifications of native tapioca starch. It is done in order to give native tapioca starch certain characteristics that it wouldn’t normally have. It’s kind of like a Frankenstarch. I’ve been able to speak with food scientists who explained the how and whys of it. And now, knowing what I know, I try to limit my intake of processed foods that contain modified starches to the few shelf stable items I buy at the store. I’m not looking to make processed food at home, but I’ll buy a loaf of Udi’s now and then in a pinch. More importantly, there hasn’t been enough research into the effects of modified starches on the body. As for whey protein isolate, it’s the same thing and more. It is a highly processed ingredient; it doesn’t just come from dried out curds and whey. And even though I understand that body builders use it to supplement their protein intake, I really believe that most people are better off getting their protein from real (recognizable) food. My goal is to develop simple, classic bread recipes for home bakers, not industrial, processed food. Sorry to disappoint you on this, I’m open to experimentation, but I try to set parameters I feel comfortable with. The weights for the flours are here on my blog, if you need them now. And although I’ll be including weights for making up the flour mix and per cup measurements in my new book, I haven’t decided if I’m going to include weights in each recipe. Let me know if you have questions about the weights! Yes, I know xanthan gum has been processed and is also added to a lot of shelf stable processed food and that I use it in my baked goods. I try to use as little as possible- a lot less than many gf bakers. And because I already use it, I am even more hesitant to “pile on” other industrially processed ingredients into the food I make. I’m hoping less is more. Yes, that was my lemon-blueberry pound cake. Everyone loved it and I am the only one who is gluten-free. That’s what I like about your recipes. Everything I’ve made has always turned out the first time so I can count on them. Since I posted in early April, I’ve also made your vanilla cupcakes again. I try not to bake goodies unless I have to provide a dessert for something or other…I just don’t need those calories. But bread is something I’m not willing to go without. Since this winter has been so brutal (I live in Pennsylvania), the Brod & Taylor proofer has been a lifesaver. I certainly understand why you want to keep things affordable for the majority as even buying misc. gluten-free flours gets expensive on a budget. I’ve dinged up more than one loaf of bread when I remove the plastic wrap. I even bought some cheap shower caps at the dollar store, which work well…but again it’s not easy to remove it carefully enough. I appreciate your input on the other ingredients I mentioned just to see what you thought. I’m pleased with the ATK classic sandwich bread I’ve made. And I have experimented with a number of different recipes from several cookbook authors and will probably continue to do so. I haven’t yet been able to get enthusiastic enough to whip up another batch of flour using the whey protein isolate and expandex after two massive fails. I have seen pictures of others successes, which have eluded me. Personally I’d love to see your recipes include weights of the flour. I really don’t think it’s necessary to weigh sugar, yeast or liquids (my Pyrex liquid measuring cup is accurate) but the flour is far more critical. Which reminds me, do you know the weight of the Authentic Foods Classical Blend flour? I’ve been using it for desserts rather than mixing my own. And have you switched to a single bread flour rather than using Mix A or B? The weight for the Authentic Foods GF Classic Blend is exactly the same as my flour mix made with their finely ground brown rice flour mix: 125 grams or 4.4 ounces. And you will find all the details here in the post on What do the flours in your flour mix weigh? All my breads use Bread Mix A UNLESS the recipe says you can use B specifically (this means I tested the recipe myself with both A and B). In my first book, Bread Flour Mix B used equal parts millet and sorghum and so it made whiter looking bread that children seemed to like if they had been used to soft, white wheat breads. That said, if you like B better than A, it would work in many of my other bread recipes, and depending on the grind of the sorghum, you probably won’t have to adjust the liquid. That was some great looking pound cake picture! And so good hear to are enjoying my recipes. I have also tried baking from GFOAS Bakes Bread and all the breads have turned out so hard, dry, and tough as to be inedible. It isn’t just you, it’s that Hunn’s book recipes are typically untested and just not very good. Yes, I’m sorry to say I’ve heard the same thing from a lot of other people. It’s really too bad. As always thanks for your hard work Annalise! We are now on the east coast in Florida so we may get to attend one of your classes one of these days. I have not yet started teaching down here but when I do, I will certainly steer my GF students in your direction! Take care! Good to hear from you! Been way too long. Hope you’re enjoying your new digs. Such different geography from the west coast, I guess it might take some getting used to. Let me know if you come up to the NY metro area! For starters, it seems silly to expect psyllium to easily sub out for xanthan, no considerations taken, and expect the same results. After all, you have spent years refining multi-flour blends and baking techniques to achieve a loaf that resembles wheat. Adjusting anything in your recipe, be it water content, flour quantities/types, or even ambient temperatures, is going to change your results, often for the negative. Why should psyllium be expected to sub without changes? Also, I have found that psyllium brands can vary WIDELY in their absorbancy, structural abilities, and as you mentioned, the ability to occasionally change the color of the dough entirely! Like coarse vs. fine ground rice flour, one experiment is hardly conclusive of an ingredient’s potential. I don’t write this to criticize you. On the contrary, I can guarantee that your experience with all things gluten free FAR exceeds my own! I appreciate all the work you do, and am learning quite a bit from your blog. But, this blog post taught me little more than that xanthan and psyllium are not the same. Not particularly profound. The one thing I appreciated is where you discussed the properties of psyllium and the significance of eggs. That will help me quite a bit in my own baking experiments. I think you brought up some interesting points and it made me see that I should have explained in more detail exactly why I used such a simple, basic recipe to see how psyllium husks powder works in my bread recipes. So thank you for taking the time to write!! I hope to explain it better here. First and foremost: I really do understand there are people who can’t use xanthan gum and guar gum, but my test really wasn’t really about developing recipes for them. I did the test because several cookbook writers and many bloggers and America’s Test Kitchen (who I usually respect), said it worked better than xanthan gum in bread. So, my test was really only designed to see if psyllium husks powder would do a better job than xanthan gum in a bread recipe I was already successfully making; ie. it had to work with my flour blend and with my recipes — without a lot of changes because I already have something that works. My interest wasn’t to design some whole new bread in order to make psyllium work. I only wanted to measure its’ worth against something that was already really good. I wanted to see if the essential nature of my bread changed in such an appreciably better way that it would be worth me reworking dozens of bread recipes I’ve already published. Second: why should I expect to replace xanthan gum with psyllium and expect the same results without having to change other things? I didn’t really – and that is why I tested 3 different amounts of the powder. But truth be told, several cookbook writers and more than a few bloggers said it could be done pretty easily and they indicated that it was a replacement for xanthan gum -clean and simple. So as to your concern that I didn’t adjust water or flour quantities (or type of flour), etc. in the bread: I didn’t change the water or flour amount because I changed the amount of the psyllium husks powder – to no lasting effect in terms of the rise. The breads all fell. But most importantly here (and as I noted in the post above), I felt comfortable with 3 different amounts of psyllium I choose to test because of the America’s Test Kitchen recipe: it actually has a similar ratio of water to flour to the submarine sandwich bread I used in the test. My recipe has 1 1/2 cups of flour to 3/4 cup plus 1 tablespoon water (and only 1 teaspoon xanthan gum, a little sugar, salt, and a teaspoon olive oil). Their recipe has 2 cups water and a little more than 3 1/2 cups of flour (plus 3 whole TABLESPOONS psyllium husks powder, butter, 2 eggs, yeast and salt and sugar). And ATK still had to add 2 whole teaspoons baking powder to get their sandwich bread to rise. If psyllium husks powder worked as well as they said in gluten-free bread (and they said it worked better than xanthan gum), it should have worked well in one of my three breads. ATK didn’t say it only works well if you add eggs and a lot of baking soda in addition to the yeast to the bread. What if they took the baking soda out? And the eggs? Would the xanthan gum have worked better then because it allowed to bread to rise and stay up? That’s my guess. But ATK didn’t explain what they had to do to make their bread “successful”, so I didn’t know. And even if I did, I’m not about to add eggs and baking soda to my submarine sandwich bread just so I can use psyllium husks powder in it. In fact, ATK didn’t develop any breads that didn’t contain eggs or baking soda or powder in their new book, including their English Muffins and country breads (none of which typically don’t have eggs or baking soda or powder). To your point the psyllium brands can vary widely in their absorbency, structural abilities, etc. : I had some inkling of that, but didn’t test across brands. I looked for a brand clearly marked gluten-free that was available nationwide. However, the fact that there is such a difference acoss brands is a real problem for such a key ingredient. Xanthan gum and guar gum are pretty much the same across brands, unless you get a bad batch (which rarely happens). I also noticed when shopping for psyllium husks powder in stores and online, that many do not say they are “gluten- free”. When I called companies to ask, I found a few that wouldn’t confirm their powder was GF -usually because of potential contamination issues from where it was processed. I see that as another major concern for GF bakers. To your final point, I wasn’t trying to be profound. I was just trying to see if I could make my own breads better if I switched from xantham gum to psyllium. 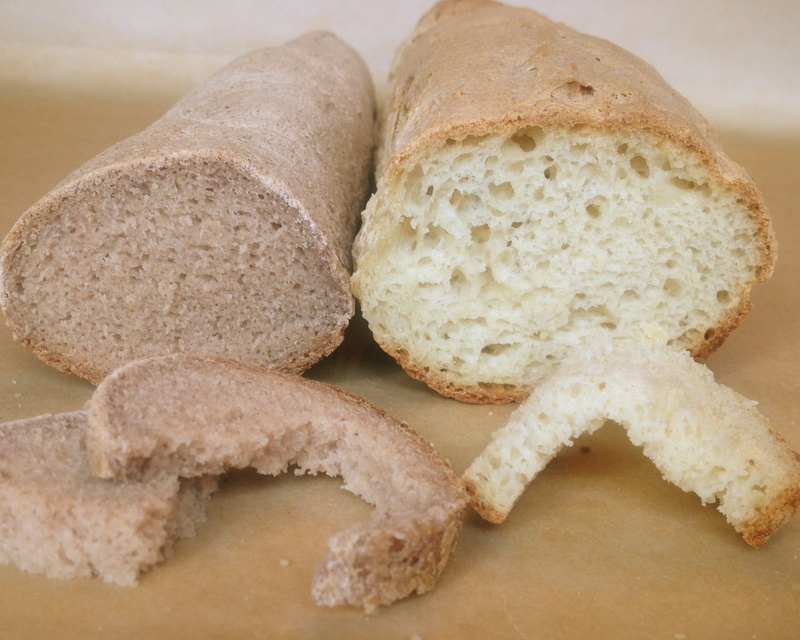 I posted the test on my blog, because in addition to the emails I get, I thought people like you who really do need to rely on psyllium husks powder (because you can’t use gums) might be interested in seeing a little “slice” of it’s essential nature in a simple GF bread. Once you have a fully loaded recipe with a lot of ingredients, it’s pretty hard to see what does what. The significance of having to add baking soda and eggs to make a bread work when using psyllium is pretty important to someone like me. Glad to hear it helped you as well! Sadly, you are not the only one I’ve heard that from. I was really hoping ATK would come up with something really innovative and delicious, too. The worst part is the many people who trust their work and recipes and don’t realize their are other really good (and more delicious) options. I find many of ATK recipes are based on a white bread, white cupcake, kind of mentality, which isn’t me at all; it also doesn’t work very well with the Bob’s Red Mill Flour because of the beaniness (and the Bob’s measurements they give are consistently slightly low as well… the consistency works better if you use Bob’s in the proportions they use for their own flour mix). I’ve had some success adding a 60% sweet rice and 40% buckwheat mix for some of the white flour, though. I do, however, find that even if their explanations don’t always cover everything they give VERY good hints to gluten-free bakers who are new to the game and want to develop their own recipes. As per Annalise’s explanation of psyllium husk versus zanthum gum, I am curious to try some experiments of my own: one with just husk, one with gum, and one with both. I am hoping such an experiment might tell me if the husk might give a better pre-bake rise and the gum maintain the rise during baking better, which between this blog’s explanation and theirs seems like the only reasonable conclusion to draw. I do think they were correct about adding almond flour to pizza dough for the crisping effect, though all the use of eggs and nuts and dairy in gf baking isn’t my favourite as some of my best friends have allergies to those things. You’re very knowledgeable, so I was surprised to see this totally untrue statement in your blog, along with the implication that psyllium husk is unnatural. Psyllium husk is not “empty calories”. It is soluble fiber. Our bodies cannot digest it on our own, but it provides an excellent substrate for beneficial bacteria, and the bacteria in our colons can ferment it into essential fatty acids and other nutrients. I’ve used it often in breads, including in your recipes. It seems to me that you just used far too much of it (and so do the people who wrote the ATK cookbook.) Too much psyllium will lead to a very tight loaf, because the psyllium does soak up a LOT of water and makes the dough less stretchable. I like to use psyllium in combination with flax. I do think it’s strange that you think things like flax seed are not “ordinary” but xanthan gum is. Flax seed is just as natural and ordinary as xanthan gum, and has a much longer tradition of being used in bread. You make a great point about psyllium husk being a great substrate for bacteria in our guts and one I totally agree with. (I researched it to make sure it wasn’t detrimental to the bacteria in our gut, just like you). But I didn’t say it wasn’t natural. I tried to start my post by acknowledging that it was a plant that has been successfully used for medicinal purposes for hundreds, if not thousand of years by humans. And I think it can make a huge difference to people with diabetes and others with intestinal distress. But if you look at the nutritional listing for psyllium husk and psyllium husk powder you will see that it really is devoid of vitamins, minerals and other phytonutrients. It does have a lot of good fiber, though! I’m just saying that I try to get my fiber from plants and nuts and seeds so that along with fiber, I get food my body. But some people really need the extra added fiber from something like psyllium – in addition to the food they eat- so perhaps for them, psyllium is the way to go. Also, maybe I didn’t do it well, but I was actually trying to defend xanthan gum as being not as bad as some detractors make it out to be when I was explaining that it was bacteria poop. The test was to see if it was worth adding another expensive ingredient to my ingredient list; I didn’t want to do it if the psyllium didn’t really make a positive difference. And yes, I agree 1 tablespoon was a lot of powder. But the 1 teaspoon didn’t work any better. I would only add it for fiber. Not to replace xanthan gum, if I were to use it. And I think flax seeds are pretty “ordinary” and I use them in several of my multigrain breads and have been for years (since 2004). And I use them as an egg replacement sometimes. But I don’t think they do a great job of replacing xanthan gum. They’re great as add-in to breads, I agree. Thank you for allowing me to clarify my ideas. Anyway, I started using psyllium in my breads when I saw on the Shär package a recipe for rolls that used the psyllium to make the dough moldable. From your description of the gelling temps of psyllium i assume it works by gelling when the dough is raw, then breaking down during baking, allowing the gums in the mix to do their thing. This allows me to use a fairly well hydrated dough to form things like pretzels and braids. So in my kitchen, psyllium has its place in creating doughs that I can form and manhandle a bit, without sacrificing soft texture. However, last year I was on a sourdough kick, and started working on a bread with 100% sprouted buckwheat, and using only psyllium as a binder. The resulting bread was really amazingly soft and pliable! I thought the psyllium did it, but now I am not so sure. Is there something special about buckwheat? Or the sourdough process? There is a guy here (http://www.recipesforliving.info/sourdough.html) claiming to have amazing results in his artisan breads using only psyllium and chia as binders. I know you were looking only at psyllium as a replacement/substitute, but I think there is something to the idea that recipes can be developed using seeds as binders using specific flour blends. Perhaps it has something to with the different starches in various GF flours. For example, buckwheat flour makes nice, flexible crepes, but rice four, at the same hydration rate, does not. So maybe my sourdough success was dependent on buckwheat. It’s a very complex subject, the interaction of the various components of gf baking, and your comments and research are quite interesting. You are correct that the psyllium husk powder can make it easier to shape some gluten-free doughs, especially when the flours are predominately starch based (like most of the Schar mixes). I agree it is useful to make doughs that don’t have to rise very high. And buckwheat flour is high in fiber and thus has better viscosity than any of the starchy, white flours in the Schar mixes. This viscosity will help delay staling and contribute to a soft crumb. I like to use buckwheat occasionally in my multigrain breads, but not as often as teff flour. 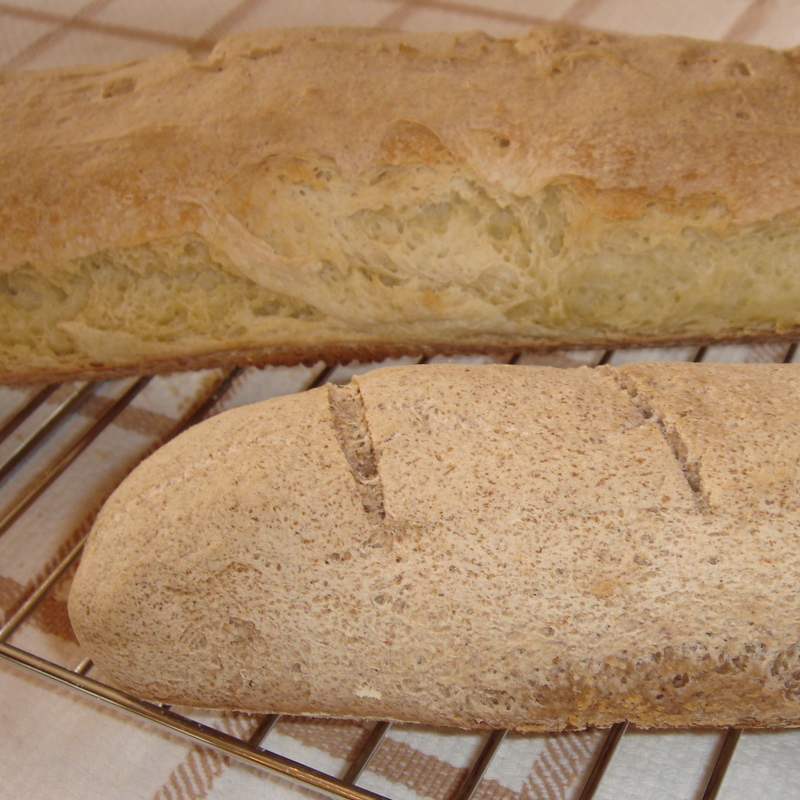 In my opinion, the buckwheat flour made a very positive difference in your sour dough bread. I checked out the link and saw the breads you mentioned above. I have to say, those breads look nicely formed but very dense— more like the psyllium based bread in my experiment above. Chia seeds help to bind doughs, just like flax seeds, but neither seed holds the rise nearly as well as xanthan gum, and they can both give baked goods a slightly gummy texture. But I totally agree with you that both will help improve the texture and taste of a very starch based bread. An yes, it is complex subject. But I think it’s fun to hear about all the nuances of what people find out while experimenting! and the sweet version in my book Gluten-Free Baking Classics. Thanks for your reply! I wonder if some of the gf bread variations one sees has to do with cultural expectations. I think Germans (I live in Germany) eat much denser bread in general, and have a rich history of 100% rye and whole-kernel breads that are most definitely not fluffy. So some people, when making what they call “artisan” breads, expect a certain amount of density, perhaps. This, I think, is the main reason I have to fiddle extensively with recipes using the Shär mixes: they are made for the European market. For example, the “cookie and cake” mix makes for some pretty dry fare with my American recipes, but the “crepe/pancake” works better for cakes and muffins. I was completely blown away at the sheer loft I got from a bread mix I bought in the US the last time I visited. It was great! At any rate, I certainly would love to try your crepe recipe–it looks wonderful. Only I am stuck on the finely-ground rice flour problem. I can’t get Authentic Foods flour in Germany, and I have not yet (in five years!) found a substitute here. One of these days I will order every rice flour available on Amazon.de, and try them all out. There are rice flours available at the Asian markets, but til now I have not found any finely ground from brown rice. Maybe I will try subbing the buckwheat. The buckwheat flour here is of the light variety and quite mild in flavor and very finely ground. Or teff, which I can also get here (though it is pricey!). Oh, and until this year, xanthan gum was very difficult to find here, too. I had to order it from England, or bring it back from visits to the US. I know I am rambling about my special problems living here that really don’t apply to most of your readers. I am very happy to have your book and excited to see your blog. Thanks again for the reply. I know that bread well! My grandparents were both from Germany and they ate something like that here. Those dense, sprouted grain breads are available in the United States, too. They’re just not as commonly seen everywhere. You can try to regrind any rice flours you buy there in the blender and then sift them through a fine sieve to get out the big pieces of grit. I know many people who do that here. Hi, hoping you’ll be able to help me. I have a bread recipe that calls for 2 Tbsp. psyllium husk powder. I have psyllium husk that is not in powder form. Should I use the same amount that the recipe calls for (2T.) or a different amount? Or, should I grind the psyllium husk in a blender in order to obtain a powder (which for me is sort of hard work as I’m no youngster)? Thank you so much. Sorry, but you should grind the psyllium husk into a powder if you want to use it in a baking recipe. But if you a blender it really won’t be a lot of work- at least compared to using a mortal and pestal. Hope your baked good is delicious! Thanks so much for doing this test & showing the results! The more in-depth info on baking chemistry is really useful, too. I’m just starting experiments with psyllium/flax/chia mix hoping to decrease gumminess & rise/fall compression I’m getting on some breads & cakes. We bake as close to whole grain as possible, so it’s challenging to start with. 🙂 But, it does usually lead to a darker products so any color from the seeds wouldn’t make much of a difference. As for you experiment- I’ve read that like flax seed psyllium works much better when freshly ground, so that’s what I’ve done. Do you think that might have played a role in the results? I’ve been baking GF just over 7 years & tried a lot of options. My best results so far have been with Orgran’s GfG which has a combo of rice & pea flours, starches, guar gum, methylcellulose & emulsifiers. It’s really shelf-stable, too. I’m wondering, is that something you’d feel is too processed, or would it be OK in the small amounts needed? Oh, and I’m one who uses weights as well- for accuracy, ease, replicability & fewer dishes, all of which can make or break my ability to see a project through to completion. Your assertion of differing weights for various cups of flour are a good point, and I’ve seen that, too. It’s one of the reasons I look for recipes developed by weight (vs converted) and always expect to experiment to find the right moisture balance for recipes not developed that way. I have actually been able to test methycellulose in my some of my bread recipes. Boy oh boy– it made my loaves very tight and very gummy and very dense. You could have knocked over a mailbox with those suckers. So I’m thinking that perhaps, this might have something to do with the results you are seeing in your baked goods?? I will be adding flour weights to my upcoming book, because I’ve found that more and more people are asking me to do it. I actually still like to use measuring cups when I bake, but I think adding the weight might be useful for those who really want to use a scale. Good luck with all your testing! Thanks for the reply- more info is definitely a help when it comes to baking chemistry, LOL! I’d love to find a comprehensive reference for gel & stability temps for the various seeds & gels. I know what you mean about straight methylcellulose- way too hygroscopic! The GfG’s balanced mix actually does very well in a good many applications. The texture problems I’m having aren’t an overall contraction like you describe but two other types: gummy mouthfeel; & a dense horizontal band within an otherwise well-developed crumb. The gummy mouthfeel comes in certain applications- especially ones where I use xanthan. I’m getting nice rise leading to a stable, rounded finish & crumb that *looks* lovely, but the cut bread looks like a perfectly bubbled sponge & in the mouth it is a bit gummy & starchy. Kind of like what you get when you cut into bread too soon, but this happens even when we wait unto the loaf is fully cooled (even overnight). I know the cutting-too-soon cause is a starch gelatinization issue so I’ve been tweaking starches. So far I’ve gotten best improvement by using potato water, counting it half as liquid & half as starch. Texture’s still not where I want it so I’m looking at gells now & protein next. The horizontal band is a rise & fall issue, I know. so far what’s helped is tweaking protein components, such as adding a bit of egg white powder. Letting yeast dough hang out in the fridge a couple of days to fully hydrate & a long, slow rise helped, too. I still get it some, so I’m moving on to adding a bit of seed gel to see if that give the structure a bump. Wow! You sound like me when I’m testing! Good to know there are more baking nerds like me out there! The gel and stability information isn’t all in one place. You have to dig around for them. And of course, even when you know the temperatures, then the concentration issues kick in and set you back. Enjoy! Thank you for a very informative article. I was recently given an English cookbook to review and it called for Psyllium-Husks in most of the recipes. This is my first exp with Psyllium-Husks, but I’ve been hearing more about it. I also enjoy your site and look forward to your cookbook. I have only been gluten free for about 18 months as well lactose free and working on lowering my intake of refined sugars, so finding such and organized resource is always a winner. Be at peace. So glad you found my article useful. It’s interesting how psyllium-husk is becoming a more commonly accepted ingredient in food. Not sure I really want colon cleanser in my bread, but then we all have different take on what’s “good”, and it does help hold gluten-free baked goods together! Let me know if you have any questions about how to adjust to the gluten-free food world. I have to disagree with you. Pysillium husk has done wonders for gf bread making. We have great bread and it has the feel or “chew” of wheat breads. I now use almost no gums in my breads. You need to account for the absorbency of pysillium. Add extra water to the recipe. It keeps the loaf moister as well. We much prefer the husk over the powdered form. The problem in your test is that you substituted it and changed nothing else which with this product was a mistake due to the differences between the gum and the pysillim. I started with Dan Leonards recipe some years ago when it came out and modified it to have a great loaf with great structure. I’d suggest playing with it again. Thanks for the article. I did the test because several cookbook writers and many bloggers and America’s Test Kitchen (who I usually respect), said it worked better than xanthan gum in bread. So, my test was really only designed to see if psyllium husks powder would do a better job than xanthan gum in a bread recipe I was already successfully making; ie. it had to work with my flour blend and with my recipes — without a lot of changes because I already have something that works (the bread I used in the test has great chew and texture of wheat bread). My interest wasn’t to design some whole new bread in order to make psyllium work or to use some variation of Dan Lepards bread. I only wanted to measure its’ worth against something that was already really good. I did allow for absorbency. I tested 3 different amounts of the powder without changing the amount of water. It is the same thing as changing the water, but holding the amount of psyllium husk powder constant. But it had no effect in terms of the rise. The breads all fell. But most importantly here (and as I noted in the post above), I felt comfortable with 3 different amounts of psyllium I choose to test because of the America’s Test Kitchen recipe: it actually has a similar ratio of water to flour to the submarine sandwich bread I used in the test. My recipe has 1 1/2 cups of flour to 3/4 cup plus 1 tablespoon water (and only 1 teaspoon xanthan gum, a little sugar, salt, and a teaspoon olive oil). Their recipe has 2 cups water and a little more than 3 1/2 cups of flour (plus 3 whole TABLESPOONS psyllium husks powder, butter, 2 eggs, yeast and salt and sugar). And ATK still had to add 2 whole teaspoons baking powder to get their sandwich bread to rise. If psyllium husks powder worked as well as they said in gluten-free bread (and they said it worked better than xanthan gum), it should have worked well in one of my three breads. ATK didn’t say it only works well if you add eggs and a lot of baking soda in addition to the yeast to the bread. What if they took the baking soda out? And the eggs? Would the xanthan gum have worked better then because it allowed to bread to rise and stay up? That’s my guess. But ATK didn’t explain what they had to do to make their bread “successful”, so I didn’t know. And even if I did, I’m not about to add eggs and baking soda to my submarine sandwich bread just so I can use psyllium husks powder in it. In fact, ATK didn’t develop any breads that didn’t contain eggs or baking soda or powder in their new book, including their English Muffins and country breads (none of which typically don’t have eggs or baking soda or powder). So the big question here is- do you have to add extra ingredients to your artisan breads (eggs and/or baking soda) to get them to work? Thank you for the allowing me to clarify my test for you. The ol’ “think I get the picture so I’ll skip the rest” gig. But as you must have noticed at the very end of my post— yes you can make a very nice bread with psyllium husk powder. It just won’t be light and filled with air pockets or be as soft and flexible as one made with xanthan gum. And it might look a little weird. But otherwise, you’ll be fine. Hope you try one of my breads with xanthan gum sometime for comparison. Im cooking a lot of psyllium and experimenting. From pictures You made I can assure that there is wrong proportions for psyllium and there may be was too much of it and it became dense. You may need to rise baking powder or yeast also. I have never had such dense bread with correct psyllium breads, they can rise much much more than any gum does. Psyllium is still in its infancy for bread making, we have to understand that. But it is not 1:1 substitute to gums, it works different. For example most good recipes that I have made uses hot water (99*c) when added to flour mix as it immediately makes psyllium to work and the dough becomes ellastic immediately. You have to try more, it may need some adaptations. Another thing to mention, Yerba Primi Psyllium Husks Powder does nto work for baking. It usually makes bread purple inside, dark and tastes like sponge. There is different variations for psyllium. Try Jay Robb one! I think you may have only looked at the pictures and not read anything I wrote. Please go back and read through the post (and look at the comments, too). Pysllium husk has been researched as an ingredient in gluten-free bread baking for several decades (since the 1990’s). It is not in it’s “infancy”. And really, I never said it was a 1:1 for gums, nor did I expect it to be. I did test different proportions. The gelling capability of psyllium husk powder is only good up to about 176ºF (80ºC) and won’t hold the rise after that; other GF bakers who think they are successfully making bread with psyllium husk powder use baking soda and eggs to compensate. The stated purpose for the test never included having to add baking soda (or eggs) to an artisan bread to make it work— just so I could use psyllium husk. The recipe was already working well without baking soda and eggs (and what kind of artisan bread uses baking soda and eggs anyway?). I want to be able to recommend Psyllium Husk that is well-known by others in the gluten-free community and this one had mentioned by others. Please give my words above another look. I’m new to your site and recipes but I’m certainly reading more positive than negative comments and your regular submarine bread looks amazing! I’ve spent the better part of two hours here expanding my previous knowledge of various flours, and also reading up on binding agents for GF baking, and from what I can tell, it seems that psyllium husk performs significantly better than the psyllium husk powder form. Anyway, I know from the article and comments that you weren’t interested in changing any other part of your recipe than the gum/psyllium substitution, but I was wondering if you planned to do any more experiments with it, or if this result has made you give up on it altogether? You’ve asked an excellent question. There are no industrial food studies on psyllium husk out-performing psyllium husk powder anywhere. So I’m not sure exactly where you picked up the information you reported to me. I did see that a well-known blogger said she thought is was better several years ago, and that only then, after that initial post, several other blogs repeated this as fact. And that is all well and good. But really, there are no scientific studies that say this. So to your question: The short answer is yes, I have tried both whole and ground psyllium husk. And again, I tried different amounts as I did here, but only 1 teaspoon and 1 tablespoon, not 2 tablespoons. The husks take a little longer to absorb the liquid in the recipe but the end game is the same. It’s not like you’re using a different atomic element. The powder just does it’s job a little faster (like adding liquid to flax seeds versus ground flax meal). The longer answer has to do with why do some people think it’s better? Beats me. My guess is that by adding whole husk, they might have inadvertently added less than if they used powder (1 teaspoon of powder weighs more than 1 teaspoon of husk) and so maybe they had less of the stuff in the end product and so it looked and tasted a little better. But it still would have the same problem in terms of not being able to hold the rise. I’d be very interested in finding out what you think once you do your own test though! Same volume side by side. And then same weight side by side. Please, if you do it, I’d love to hear back!! Thanks for the time and effort of the test. However, I can tell you just by looking at that psyllium bread that way too much was used. The ratio is incorrect. Most likely by at least twice as much. If anyone has problems with xanthan gum, psyllium us a fine alternative and I actually find it preferable as it DO s not create a gummy mouthfeel as xanthan gum can. It also adds fiber and is fantastic for digestion. Xanthan gum certainly is lovely in delicate baked goods, but for many recipes psyllium is nice as well. The trouble with my pictures is that they really aren’t all-revealing. That is why there are so many sentences of carefully written words surrounding the pictures on my post; my pictures do not do justice to all the time and effort and multiple steps that went into my test. But my words on the page explain it all. To summarize for you: I did multiple tests with multiple amounts, including amounts/ratios recommended by America’s Test Kitchen. The issue with psyllium husk isn’t the amount, the issue is the essential nature of psyllium husk to only be stable up to 176ºF, and to therefore require eggs and baking soda to do the work of keeping the bread up and improving the rise. Also, as I’ve explained in my books, xanthan gum will not create a gummy mouthfeel when used in the proper amount. That said, many GF bakers seem to use too much of it, which is why it seems to have acquired a reputation for it in some circles. Hope this clear thing up for you! I just want to let you know that psyllium husk is the best ingredient in gluten free baking in my experience. Here is my latest experiment – egg-free, dairy-free, gum-free, sugar-free, fat-free and gluten-free, only basic bread ingredients except the flour and psyllium husk. Take a look. Your bread looks lovely. Bravo! As you might know from reading my work, I’m not a fan of gluten-free breads made with rice, and I dislike the flavor of chickpea flour in all gluten-free baked goods, so your recipe wouldn’t be a good one for me to make. But the important thing is — you were able to successfully make a great looking bread that pleases your own palette! And there a lot of people who do like bread made with rice and chickpea flour. So I hope you keep testing and fine-tuning recipes, are that you are able to develop a whole array of delicious breads to enjoy. Thank you for sharing and happy new year! Actually, rice in my bread is very little, I use a variety of flour like buckwheat lentils, ragi, etc. as well 🙂 Here is my GF album if you are interested. Happy new year and keep it up! For gluten free bread/baguette, Psyllium may not win against Xanthan. BUT, psyllium rules in anything that needs rolling out – roti/chapati. The dough is wonderfully elastic and pliable with psyllium – just like wheat. Tastes great. I agree entirely that psyllium husk would work well in flatter breads that need to be rolled out and that don’t have to rise much. Thank you for mentioning it. I wish you lived in Iowa! I am new to a bunch of allergies. Yeast… and anything that ferments. You seem amazingly knowledgeable. Can you tell me if guar gum ferments? Although several hydrocolloids are formed through fermentation, and industrial food science has studied the effect of them in dough fermentation, to the best of my knowledge, they cannot be fermented in and of themselves. Thanks for this highly informative experiment you did. or xanthum gum for that matter — for the golden flax seed flour called for in the ATK _I Can’t Believe It’s Gluten Free II_ cookbook? I can’t tolerate flax seed — gives me a belly ache, and about half of those recipes call for it. I realize that in in neither case, will the substitution be probably not be 1:1, but just anything I can do to mix up a bag of flour to use in their recipes would help. Also, I am looking for a great, moist, dark GF gingerbread cake recipe. Can you recommend one? You’re very welcome! I’m glad you found my experiment worthwhile! As to your ATK flour sub question: I’m sorry, but I can’t really give you substitution advice for recipes that I have never seen and have never made (and I only have the first ATK cookbook; I didn’t bother to buy the second one after testing through their first). And in reality, it also really depends on what purpose the flax seed flour serves in the recipe (ie. extra fiber, texture, or as a gum substitute). As for a recipe for a moist, dark GF gingerbread cake recipe, I have a delicious one in my first cookbook- Gluten-Free Baking Classics. Perhaps you could find the book at the library and give it a try (or buy it on Amazon or somewhere)? Let me know if you have any other question. I’d be happy to try to help. Please excuse the double negative. I meant “I realize that in neither case will substitution be 1:1…”. Pingback: Gluten-Free Baking: What Is There To Know About Xanthan Gum? Annalise, I am a diabetic who for 40 years has known and understood the health benefits of a low carb diet. The issue was never the knowledge of the benefits, it was the stealthiness of the desire for carbs in certain forms. Breads are always my downfall, or more precisely, the lack of them on a low carb existence. Your revelations about the properties of xanthan gum, as opposed to psyllium husks is a Godsend for people like me. My all time favorite food is a sub sandwich, which when made from a wheat based bread has about 36 Net grams of carb (bread only). Your sub bread with xanthan looks superb, I can’t wait to try it. You’re welcome! I’m not sure of the carb count in the submarine bread – but it does have some starch in it; you might not want it as an everyday food. But it also contains a good deal of whole grain millet and sorghum, and it’s a really delicious bread. I hope you enjoy it! I plan on making bread using 1 cup mix of almond and coconut flour with 4 T organic psyllium husk powder. Could I replace the psyllium husk powder with 4 t xanthan gum?? Or what can I use for substituting the php? I honestly can’t even begin to imagine a bread with one cup of flour and 4 tablespoons psyllium husk powder. Moreover, I’d need more details in order to give you a better answer: Does the recipe contained milk or eggs? What kind of leavening? What are the amounts of the other ingredients? What is the shape of the bread? What kind of pan? I would never use 4 teaspoons of xanthan gum in any basic home recipe (the ones that typically contain 1 to 3 cups of flour). That is a HUGE amount of gum, more than enough to create a bread so dense and heavy you could knock down a telephone pole with it. One thing I can suggest is this: find other recipes that look like the one you are using and see how much xanthan gum they use. Thank you so much for this comparison! Have started doing some research on baking, and there’s so much to learn as a newbie, especially when looking at some of the alternative recipes out there. Were I to make a recipe like those for low-carb baking, do you think something like that might be able to converted to a xantham gum setup instead? And have you, by chance, tried other alternative thickeners, like konjac, arrowroot powder, or gum arabic (acacia powder)? I’ve tried to see if you had another alternative comparison like this page’s, but didn’t see anything, so I wanted to ask. Thank you again for the wonderful resource. My opinion of the Primal Health recipe is that it is really more of a coconut flour-egg loaf that uses baking soda instead of yeast. To my mind, it isn’t really “bread” in the traditional sense. That said, I think this type of loaf is very important for people whose medical condition (epilepsy, in particular, and grain intolerances/allergies) is improved when they reduce and/or eliminate most of the carbs in their diet. But I stick with not being able to imagine a classic-style loaf of bread made with 6 tablespoons of psyllium husk. Arrowroot powder is simply arrowroot flour. It lacks the properties of xanthin gum. Konjac, a fiber, will have the same issues as psyllium husk. I’ve had the opportunity to test cellulose gum, inulin, seed gels, psyllium husk powder, protein isolates, modified starches (most of which aren’t available to home bakers), and methylcellulose. I haven’t found anything better than xanthan gum – as of yet- that results in a traditional, classic texture in my recipes. And of course, me being me, I’ve tested some of these products in recipes that the were “created to use them”. I still wasn’t sold. In order for you to replace the psyllium husk powder with xanthan gum in these particular recipes, you’d have to tweak the other ingredients because the psyllium absorbs a lot of liquid. You’d be better off finding a keto-type recipe that actually uses xanthan gum to try.